We have a great day planned full of fun events and activities for the community. Live bands and dj's, sports demos, break dancing, fashion shows, t-shirt booths, food trucks, games, art fusion, mixed martial arts, and tons more. 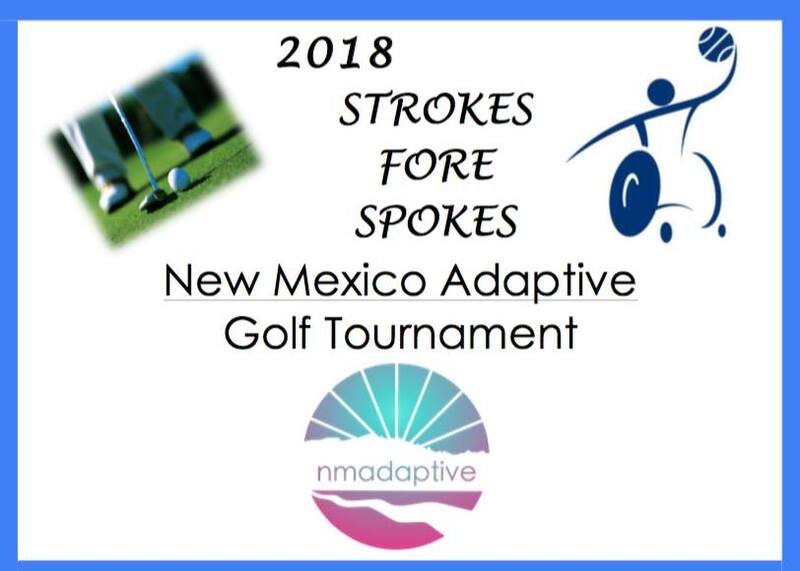 All money raised will benefit the Albuquerque Kings Wheelchair Basketball team to help with the 2014/2015 season and to help them further expand their adaptive sports program. Be sure to ask how you can purchase your pre-sale tickets! 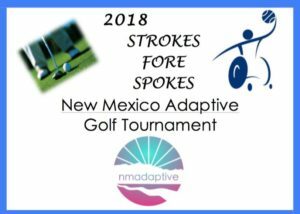 This has been made possible in association with the Albuquerque Activist Coalition: Duke City Darlins Inc, Archetype Dermigraphic Studio/Gallery, New Mexico Guild of Ethical Tattooists, Warehouse 508, Who I Am Foundation, NMX Sports and the Albuquerque Kings Wheelchair Basketball. 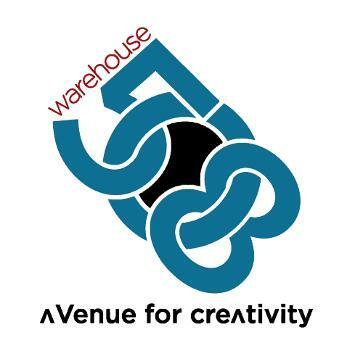 Parking: Available at the parking lot on the South side of Warehouse 508. Oh yea! We have some good treats for the event! Who is the best Able-bodied Wheelchair Basketball team in the city? Bragging rights for the next year. 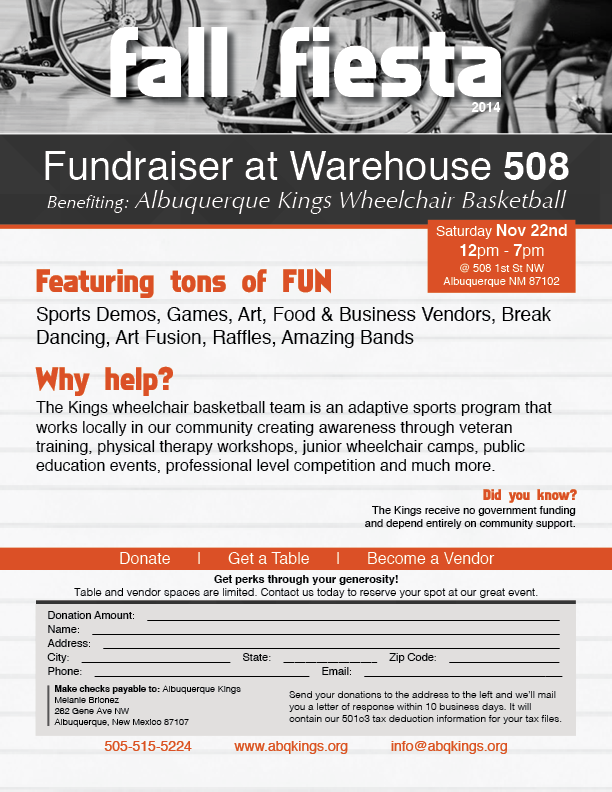 This is a Fun(d)raiser for the Albuquerque Kings Wheelchair Basketball team. Come enjoy good competition and support the KINGS. Do you have questions? Check out our FAQ or feel free to email us, ask us a question on Facebook or most other social media pages! Will I be standing or sitting in a wheelchair? Wheelchairs designed for basketball will be provided for every team. Each player on the court must be in a wheelchair. What are the rules? Rules are almost identical to stand up basketball, the few minor exceptions will be overlooked for all players. Will there be referees? Yes, players from the Albuquerque Kings will be refereeing every game. How long are games? Each team will play for a predetermined period of time (Usually two 12 minute periods), winner of the game will move forward in the winners bracket and loser will move to losers bracket. How many people on a team? As many as you like, however, there are only 5 players per team allowed on the court at a time. For more information and to register Contact us via our website or with the below information. 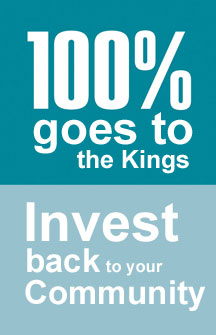 Help the Albuquerque Kings start the 2011/2012 season with a bang. We’ve been training hard this summer to represent New Mexico but we need your support. If you would like to sponsor, donate or have an opportunity for the Kings to fund raise then we want to hear from you. It is the support of the community that keeps us on the court so please don’t hesitate to Contact Us with how you can help. 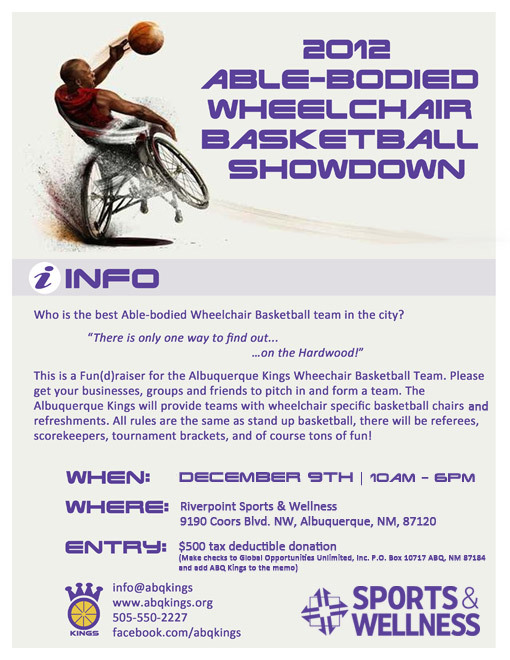 As an extension of Global Opportunities, you can be assured that your participation, donation and contributions will directly helps the Albuquerque Kings Wheelchair Basketball team. Please help us support Global Opportunities Unlimited by donating to the silent auction, purchasing a dinner, or having your company purchase a table! When you call to reserve, just let them know that its on behalf of the Kings and GOU will kindly reserve your donations for our 2011/2012 season. Libations will be available. We will have a silent auction, raffles and door prizes. It is a plated dinner @ $30 per-person. Sponsor company tables for $300. For more information email the Kings at info@505life.com or call 750-GOAL! 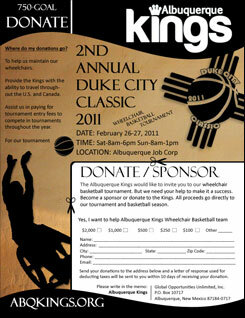 If you missed the Duke City Classic 2011 wheelchair basketball tournament have no fear. We need to sell off our remaining stock of t-shirts and rest assured that 100% of the proceeds will go back to the Kings. This means we’ll be selling the last of our shirts for only $10 or 2 shirts for $15. You can’t beat that price for a one of a kind 2011 DCC shirt!. To make your order, use our contact form and select t-shirts. You can also contact us via our Facebook page to make your request. You can pick up your shirt at any of our practice times or we can arrange to bring them to you. For any mail orders, a shipping and handling fee will be added in accordance to standard shipping fees. Our next to tournaments will hopefully be in Denver and Toronto Canada and we’ll need to restart our fundraising if the Kings are able to make it. Thanks again for you support! Help the Kings raise money!.. 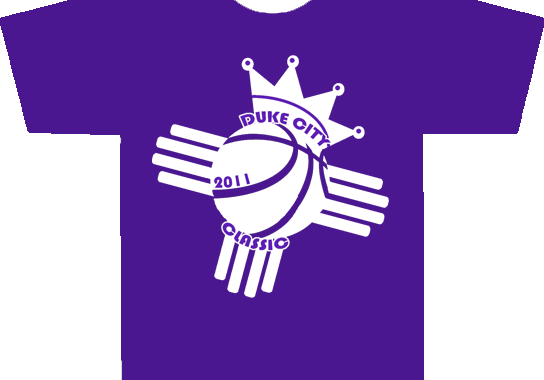 We need your help to raise money for our 2010/2011 basketball season and to be able to host the 2nd Annual Duke City Classic right here in Albuquerque. Your help is greatly appreciated and is also 100% tax deductible (we are under a 501 (c) (3) organization). 1/2 of all proceeds go to the Kings 2010/2011 season! The Albuquerque Kings have teamed up with the New Mexico Thunderbirds to help raise money for our 2010/2011 basketball season. Tickets are $10, and 1/2 of all ticket proceeds go directly to the Kings. We also plan on having a booth there and playing an exhibition game at half time. 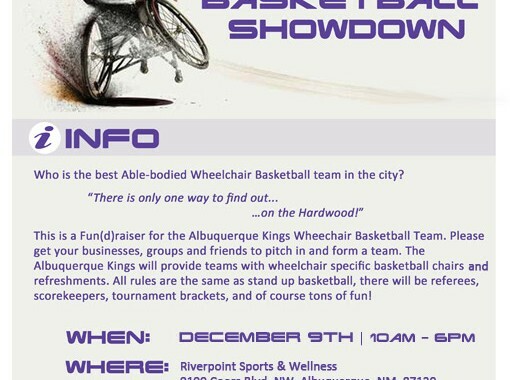 If you never seen us play, this is a great way to get exposed to wheelchair basketball. Purchase as many or as little as you want. If you where planning on going to any Thunderbirds games, help us out by purchasing them from the Kings! The Kings are always thankful for the community support. If you are interested in purchasing tickets. Call us at 750-GOAL. Leave us a message with how many tickets you want and the best way to contact you. You can pick up tickets at any of our 3 practices during the week or we can arrange to deliver them to you! The Kings will be fundraising during the following dates. Please check back for updates to this story. 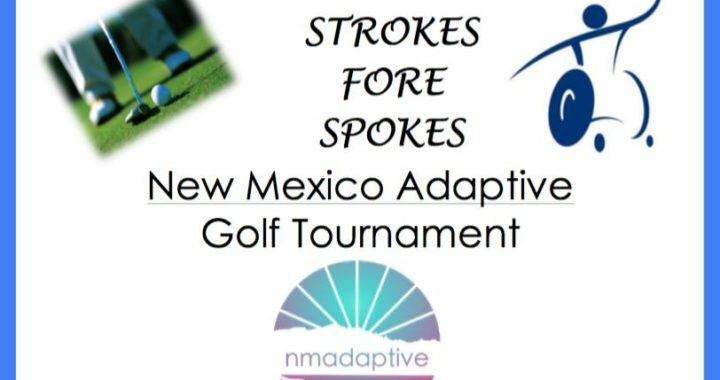 We are currently fundraising for the Texas International Shootout on September 3-5, 2010. If you are able to provide a location and day for the Kings to fundraise please contact us at your earliest convenience with the details. Your assistance is greatly appreciated.